The wedding party. It’s one of those parts of wedding planning that can feel hard to sort out. Maybe you want people you love around you, but those traditional lines of all matching friends lined up by gender doesn’t feel like it has much to do with your real life. 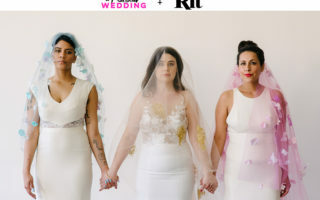 Or maybe you’re just not sure what bridal party members are supposed to do, really, and who you should ask to be in yours. If you’re trying to make sense of the wedding party in the millennial world, you are in good company. While having a wedding party is obviously not required (and some people are apparently over it), it can be super fun to have your people as part of your wedding day and the process leading up to it. Plus, asking them to be part of the festivities will make them feel incredibly honored. And ask them however you’d like—you don’t have to “propose” to them with a BRIDESMAID mug or anything if that’s not your style, and I think asking over dinner, or a video/phone call for long-distance buddies, is just as special. Stay true to yourself and your relationships: if you spend most of your time texting GIFs to your future best person, you can ask them that way too. And while we’ve talked about how to pick your bridal party, once you ask them, what exactly do they do? Or, to take a step back, who should you ask in the first place? I’ve fallen into the habit of using the terms “Bride Gang” and “Groom Squad,” or “[Partner 1]’s Party” and “[Partner 2]’s Party.” I don’t use the terms “bridesmaids” and “groomsmen” because more often than not, they don’t apply. Mixing up genders on either side is much less rare than it once was, now that most of us have recognized the fact that your close friends may not always be of the same gender. So honor your people in whatever roles make sense to you and your partner. With that said, let’s review who’s in the wedding party and define some terms that you’ve likely seen and heard before. This is typically the closest person to either partner. (The term “maid” traditionally refers to an unmarried woman, while “matron” refers to a woman who’s married, but call your honorees whatever you’d like, marital status not withstanding.) This person is often standing right next to you during a secular or religious ceremony (holding your bouquet, if you have one, so you can hold Your Person’s hands), holding the rings, holding the chuppah if you’ve got one, signing your marriage license, making a speech at your reception, taking the lead to plan pre-wedding activities to celebrate you, and even helping with wedding planning. You know, best friend stuff. That said, it’s perfectly okay to pick someone for this role and have them serve in a more honorary capacity, without the list of responsibilities. Maybe your sister just had a baby, and she’s not going to be able to do much other than hold your flowers while you say your vows, but you still want her standing next to you. Go for it (and do her a favor and have a conversation about your realistic expectations when you ask her to participate). While ushers are less common than they once were, they do exactly what you might expect: help get everyone seated at the ceremony and hand out programs. This is a good job to give the tweens or teenagers in your world, because it’s just enough responsibility for them to feel special and included, but not enough that they can screw anything up. (If the usher totally drops the ball, people will generally find their way to a seat just fine. Zero pressure!) Ushers traditionally have been men, but this is a good job for anyone who’s friendly and welcoming. They’re best suited for somewhat formal weddings, and you’ll only need about one per fifty guests. If you’re having kids in your wedding, it’s likely that you’re having them in these roles. Typically, flower girls and boys are under ten years old and tasked with tossing petals along the aisle before the bride or couple enters. Ring bearers get a tiny pillow or something else adorable to bring the rings down the aisle (if they’re going to float around your venue all day, not the real rings!! Please!!). And they often walk with the flower girl(s) or boy(s), or just before or after. Literally any child can perform either role, as long as they’re old enough to walk down the aisle alone and in a relatively straight line. These roles can also be filled by teens or adults! I’ve seen and loved flower grandmas. Depending on the type of ceremony you’ve chosen, your parents may walk you down the aisle, sit in the front row, stand with you and your future spouse, or some combination of the three. Grandparents, too (if your grandparents are no longer living, it’s a nice touch to incorporate them into the ceremony somehow, such as by printing their names on programs or lighting candles). If your parents are acting as “hosts,” or joint hosts, they can also be part of your receiving line if you choose to have one. At the reception, fathers have traditionally made speeches, but there are no rules against hearing from mothers, as well. Parental figures can play these roles, too! If you’ve watched a royal wedding, you know what a page is. Typically they’re young boys (although I’d like to see some young girls doing this, please), and they help the bride with her veil or train. This usually makes sense when we’re looking at cathedral-length veils and trains, because it really is a lot of fabric to manage and adds an adorable and sweet touch. If you’re a bride with a lengthy veil or a train on your gown, here’s a pro-tip: make sure to have at least one person (outside of your wedding party) fluff it up behind you before you make your entrance. Many Jewish couples choose to have their chuppah already standing at the start of the ceremony, but a beautiful tradition is to have your wedding party or other people of honor hold the poles of your chuppah. The poles of the chuppah symbolically represent the walls of the home you’re building together, so ask anyone that’d you’d symbolically like to help hold up those walls. Word to the wise: while a handheld chuppah might seem cool, many a chuppah holder has fainted during the ceremony, trying to hold up that unwieldy structure. Even if you want your chuppah carried in (chuppah carriers are also a thing), consider having a stand to insert the chuppah into, so the holding is more symbolic. And don’t forget to thank your party when all’s said and done. It could be as simple as a thoughtful note and a photo from the wedding, or something more elaborate, like a spa day. They do these things out of pure love, but they’ll appreciate that you recognize the emotional support, time, energy, and money that they’ve dedicated to you and your wedding. Now how about you? Are you having a wedding party? Are you keeping it traditional, or no? What problems or joys are you experiencing with your best people? What questions do you have? Allison Davis is the founder of Davis Row, a creative wedding and event planning company. Allison approaches everything with a friendly-yet-calm demeanor, quick sense of humor, and sometimes-overwhelming empathy. She lives in New York City, where she has produced weddings and events for the past five years.